Analogous structures are structures which serve similar purposes yet are found in species that have come from different evolutionary lines. The study of analogous structures is a type of anatomical comparison between two different species, used to gain evidence for convergent evolution. How are analogous structures used to gain evidence for convergent evolution and what are some examples of analogous structures? Let’s take a look at some examples of analogous structures. Evidence for evolution comes in many different forms, from fossils, DNA sequences, and the discipline of developmental biology among other sources. Anatomical comparisons between species of animals is one of the most common ways that scientists determine the evolutionary history of different animals. There are different types of evolutionary patterns, convergent evolution and divergent evolution among them. It’s important to understand the differences between the two types of evolution, as it gives context to the difference between analogous structures and another form of anatomical comparison known as homologous structures. Convergent evolution refers to the phenomenon where different species become more similar to one another over time. A reason this may occur is that species which live in similar environments are often subject to the same evolutionary pressures, and thus evolve to occupy the same or highly similar ecological niches. One example of convergent evolution is the similarity between Asian fork-tailed sunbirds and North American hummingbirds, which look extremely similar despite coming from different evolutionary lineages. The birds were subjected to similar environmental pressures and became more similar due to living in similar environments. The opposite of convergent evolution is divergent evolution, where one evolutionary lineage splits apart overtime to give rise to different species. Divergent evolution is often caused by shifts in environmental pressures, which may occur due to changes in the environment or due to a species migrating to a new area. If a species migrates to a new area and is forced to fill a new ecological niche, a new species may evolve rather quickly. This form of evolution is sometimes referred to as adaptive radiation. An example of divergent evolution is a type of fish referred to as the Characidae. There are many different lines of Characidae which evolved from a common evolutionary line over the years, with the teeth and jaws of the fish changing to adapt to food supplies present in the new environment. Both tetras and piranhas are examples of the divergent evolution witnessed in Characidae. As previously mentioned, analogous structures are structures within the bodies of living things that fulfill a similar role even though they come from different evolutionary lineages. The most frequent cause of analogous structures is convergent evolution, where organisms are subjected to similar environmental pressures. This can occur in different areas of the world, it doesn’t have to be the same area. All that is required for a structure to be an analogous structure is that the structure has evolved due to similar selection pressures found in similar environments, creating a need for the different species to fill the same niche in the different areas. The general process of natural selection doesn’t change based on geographical location, so despite the different areas, if the environment is similar the same kinds of adaptations will be favored for preservation and passed down to the offspring of individuals with those adaptations. This process continues until most of the population of animals has that adaptation. Significant adaptations can end up changing the structure of the species, body parts may transform, be lost, gained, or shifted around in the process of evolution, depending on what function the body part plays. Body parts that are unnecessary or of mild help in a new environment may shrink or be lost entirely while body parts that prove useful in the new environment may grow. The study of analogous structures has proven immensely beneficial in uncovering the evolutionary lineages of species. Early taxonomies of species, such as Carolus Linnaeus’ attempt, often grouped animals into groups based on superficial characteristics (similar looking animals). This created groupings which were incorrect when they were compared to evolutionary groupings based off of analogous structures, which proved that species didn’t have to be related to look similar. It is important to remember that analogous structures don’t necessarily represent similar evolutionary paths. An analogous structure may have evolved under one set of circumstances long ago, while its counterpart structure on a different organism may be fairly new in comparison. Analogous structures may also shift and transform through different stages, looking quite different from one another before they end up looking similar. This means that analogous structures aren’t necessarily evidence for a common ancestor between two species, and in fact, it is more likely that the structures merely arose under similar circumstances and that the organisms are hardly related at all. 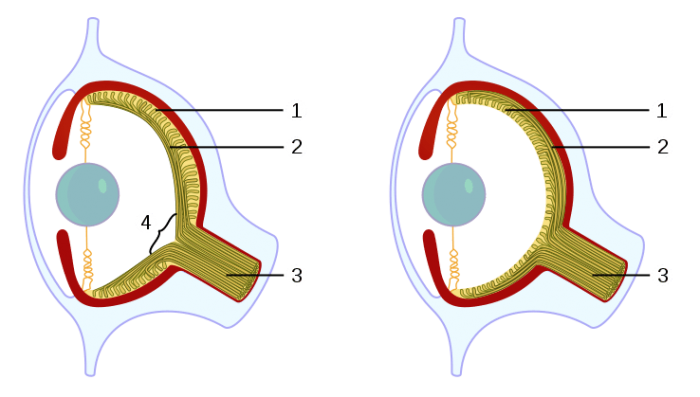 One of the most notable examples of analogous structures is human and octopus eyes. The eyes of humans and the eyes of octopi are very similar for the most part, with the only substantial difference being that the eye of an octopus doesn’t have a blind spot like the human eye does. Yet octopi and humans aren’t very related and are located far away from one another on the phylogenetic tree. Dolphins and sharks are another notable examples of analogous structures and convergent evolution. The two animals share many features, including their overall body shape, coloration and fin placement. Yet dolphins are mammals while sharks are fish, meaning that in terms of evolutionary lineage dolphins share more in common with rats than sharks. This is supported by DNA evidence. 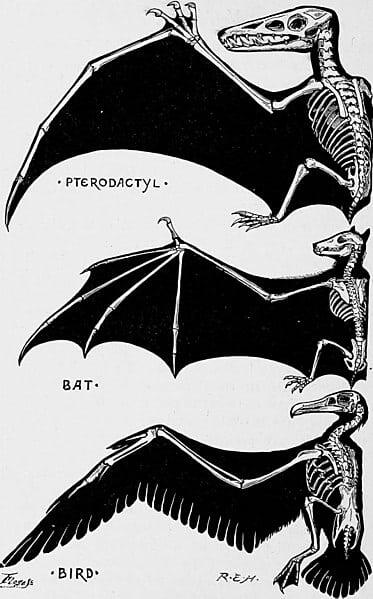 Wings are one of the most common examples of analogous evolution, as many organisms have wings yet evolved them in different ways. Insects, birds, and bats all have wings, yet bats are mammals and more closely related to their other mammal cousins than insects or birds. Remember that the conceptual opposite of analogous structures is homologous structures, which exist in animals that have a common ancestry yet are different in function from one another. These homologous structures arise due to convergent evolutionary pressures.